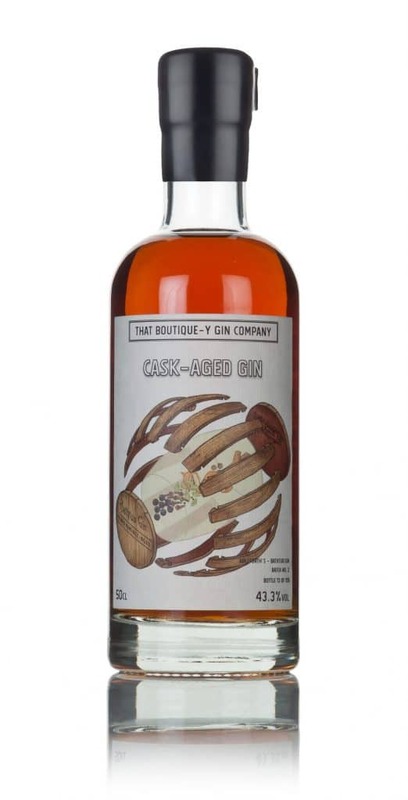 This is the second Sherry cask experiment produced by That Boutique-y Gin Company who specializes in experiments, one-offs and creative adventures by some of the top distillers in the world of gin. The first one experimented with that peculiar type of Sherry known as Palo Cortado. Bathtub Gin Pedro Ximénez Cask-Aged opts for resting its bathtub style botanicals macerated gin in casks which were formerly part of a Solera for producing the rich, syrupy, dessert sherry. An extraordinarily limited run of only 105 bottles, it sold out in the first week of release; however, as of writing small samples (like the one I’m tasting) are still available for about $4/30mL. The color is a golden/amber hue; with a glassy, clear transparency. Toffee, cinnamon, ginger, raisin, and orange zest on the nose. A kiss of sherry wine and oak barrel add some of the expected notes that the name “Bathtub Gin Pedro Ximénez Cask Aged Gin” suggests. The palate is dark and slightly fruity with thick suggestions of syrup marinated walnuts, slightly burnt fruit cake. Mid-palate dark maraschino cherries, pecan pie, molasses and raisin. Late palate a slight warmth and oxidized wine note, as well a hint of Cabernet Franc dessert wine, cinnamon stick, and a hint of juniper and oak. The Sherry cask adds a nice sherry note to it; however, the spirit is not overwhelmed by it. As well, the bathtub gin part which can sometimes be overwhelming in terms of botanical flavor feels balanced and evened out. This is a lovely complement of two non-traditional gin techniques that work well together. As for cocktails and drinks I’m not sure I can advise mixing. If you were lucky enough to get a bottle, this is better meant to be sipped neat or on the rocks. A well balanced mix of Sherry Cask and fresh spices, Bathtub Gin Pedro Ximénez Cask Aged Gin is a solid product that I think sets the stage for future experiments, but is a worthwhile product on its own, that if it had a wider release, I think would be sure to find fans among gin fans who also like bold brown spirits.